Amara PhD, is a professional Middle Eastern dancer and teacher whose specialties include belly dance, Middle Eastern folk dance, and theatrical/experimental dance. Her performance background includes solo and company concerts across the United States, long-term performing engagements at many nightclubs and restaurants in Los Angeles, Las Vegas, and Austin, and being featured in over 15 commercial videos. In addition, in Los Angeles Amara was the Director of Ya Helewa! Dance Company. She regularly teaches studio classes in Middle Eastern dance, fitness, and flexibility to children and adults and has taught accredited courses at UCLA, UCR, and Cal Poly Pomona. Amara directs Training4DanceTeachers, a teaching certification program for dance teachers. 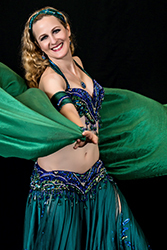 In addition to teaching and performing, she has produced numerous concerts and workshops, such as the “Austin Belly Dance Convention,” “An Evening of Experimental Middle Eastern Dance (EEMED),” "X–MED," a workshop series presenting tools and methods for creating experimental Middle Eastern dances; “Tarab,” a live music and belly dance showcase and workshops; and “Improvisational Dance Series.” She holds a PhD in Dance History and Theory (UC Riverside), a BA in Music History and Literature with a certificate in Ethnomusicology (Florida State University), and worked towards an MA and MFA in Dance (UC Los Angeles). She has published articles in numerous Middle Eastern dance magazines and has presented papers at leading international dance conferences including, Congress on Research and Dance (CORD), Society for Dance History Scholars (SDHS), and Oral History Association (OHA). Currently, she is General Manager for Critical Path, Australia’s leading choreographic research facility.